There are many unforgettable sights in the world. 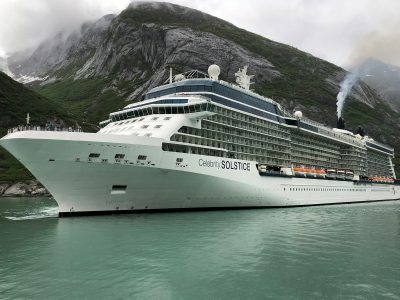 Looking up at glaciers in Alaska and the icy fjords of the Inside Passage, while the bow of your cruise ship gently ripples the calm, crystal-blue water all around you, is certainly one of them. The seaward approach to the fortified old-town of Dubrovnik on the sun-scorched Dalmatian coastline of Croatia is another. 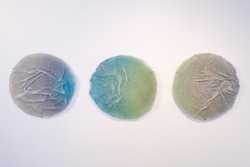 But watching molten glass take on a strange new form while the silhouette of New Zealand’s Southern Alps mountain range grows on the horizon, might be, hands down, the best sight of all. Many of the gaffers at The Corning Museum of Glass have had the opportunity to experience these places and marvel at the beauty and diversity this planet has to offer, as they venture out from port with the Museum’s Blow Glass at Sea program with Celebrity Cruises. 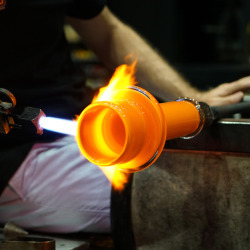 For the past 10 years, the Museum has successfully partnered with the Celebrity Solstice, Celebrity Equinox, and Celebrity Eclipse to bring hot glass demonstrations and the wonder of glass innovation to people and places the world over. As that endeavor ends and new, exciting ventures take its place, Museum staff that helped build and shape the program over the course of a decade remember the moments that will remain with them for years to come. For Chris Rochelle, hot glass projects team leader, working at sea was an unbelievable experience. “Never in a million years could I have seen this coming,” he says. 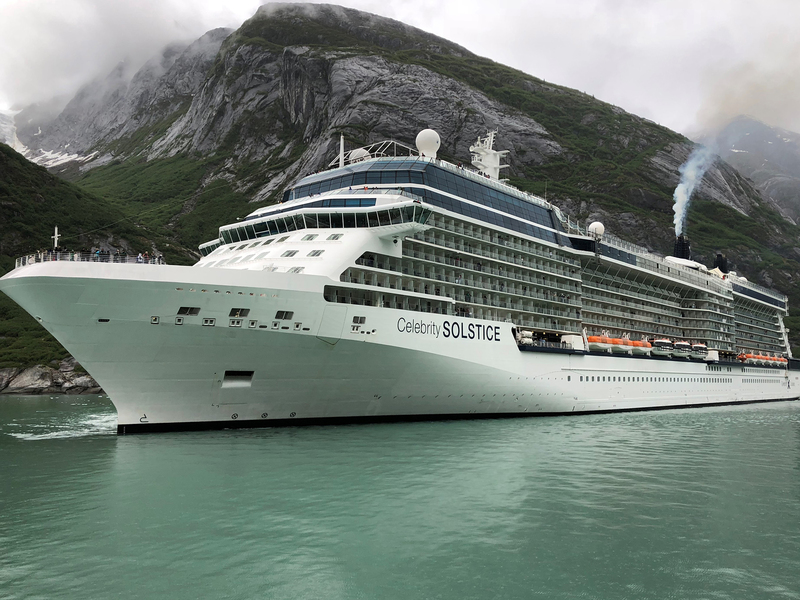 Now, with 10 deployments and 50 countries under his belt, he still remembers the inaugural voyage of the Celebrity Equinox and docking in the Norwegian town of Geiranger, a small port at the head of a long, narrow fjord, surrounded by mountains. “A mystically beautiful landscape adorned with small houses and winding roads, walking paths that curved in and out of the never-ending scenery. One of the most beautiful places I’ve ever seen, straight out of a fairytale!” Rochelle recalls. Logan Brooks assists Kim Savoie during a demon on a recent cruise on the Celebrity Solstice. Stephanie Perry, Logan Brooks, and Kim Savoie show off their work from a recent cruise on the Celebrity Solstice. 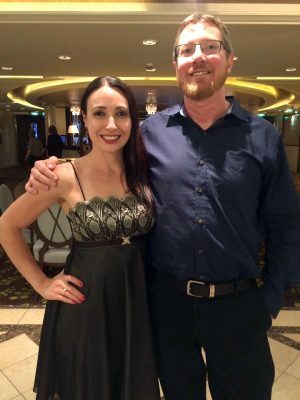 Aaron and Sanja met on a Celebrity Cruise ship. With this litany of skills at their disposal, our fleet of glassblowers confidently set sail time and time again. 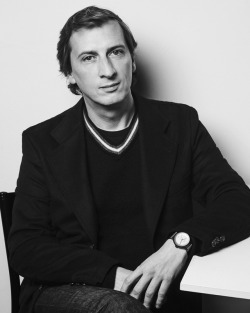 Jon Heath is the Marketing & Communications Coordinator at the Corning Museum of Glass. One of our best memories from our many cruises on Equinox. Proud to have befriended Aaron Jack, Lauren Hunt, Katie Plunkard, Tom Ryder, Megan Mathie, Stephanie Perry, et al. Talented, brave, adaptable, creative and fun! My wife Kay and I have enjoyed about 9 years of cruises on CMOG equipped ships. Having watched about 750 different pieces being made by a lengthy roster of glass artists, many of whom we stay in touch with and follow. My love of hot glass has led to me making a few pieces ashore and finally experiencing CMOG first hand and taking a beginners class last fall. I have been bitten! Thank you CMOG and Celebrity for many hours of rapt entertainment and a large body of understanding made fun my those great, talented gaffers! We’re very disappointed this wonderful program has ended. Through the past years we’ve even booked our cruises based on it being with those three Celebrity ships. Most of all we’re so grateful for the memorable experiences, the phenomenal glass treasures we now own, and especially to those gaffers we’ve come to know and cherish friendships with. Special “Thank You” to Ryan Doolittle, Aric Snee, Laurie Kain Bousquet, Diane Stendahl, Ian Schmidt, Megan Mathie, Stephanie Perry, Jamie Perian, Rebecca Potash, Logan Brooks, and so many more. And especially to Corning Museum of Glass!